Breakfast has long been lauded as the most important meal of the day. The etymology of "breakfast" comes from the words "break" and "fast," meaning breakfast allows one to "break" the "fast" that comes from our lack of eating while we sleep. Nutritionists have hailed breakfast and its abilities to allow individuals to consume essential nutrients and calories at the start of the day, and coffee, a beverage commonly associated with breakfast, contains caffeine, a substance with known beneficial properties. A recent report from the New York Times finds that residents in Los Angeles, a city known for many things that aren&apos;t breakfast, are actually eating breakfast en masse. On Tuesday, the New York Times reported that Angelenos are now forming long lines at popular restaurants to enjoy breakfast. "I went to République the other day, and there was a line down the block at 9 a.m. on a Saturday," Everybody Loves Raymond creator and food show host Phil Rosenthal told the Times. "It&apos;s all delicious and it features the produce that we have." Indeed, many of the chefs at places like République, Gjusta, Trios Familia, and even Sqirl are using ingredients available to them to create tasty dishes that can be consumed in the morning, the time of day traditionally associated with breakfast. And while breakfast often consists of food items such as eggs, bacon, pancakes, oatmeal, and cereal, these chefs are finding innovative ways to present these dishes. Burritos are being served at breakfast (Cofax calls it a "breakfast burrito", reports the New York Times), and eggs are being paired with or topped on other menu items. In fact, restaurants are breaking free from the usual constraints of breakfast in ways beyond the menu. The report cites downtown&apos;s Original Pantry Cafe as one location that serves breakfast 24 hours day, and many places serve their breakfast menus well into the afternoon, beyond the hours traditionally associated with both breakfast and lunch. According to the report, the constraints of workday life in New York have often relegated breakfast to "a bacon-egg-and-cheese scarfed down on the F train." Cultural observers have noted that New Yorkers have begun experimenting with breakfast in a meal known as "brunch" (a portmanteau of "breakfast" and "lunch") in recent years—particularly in cutting-edge, trendy neighborhoods such as Brooklyn. This move has become controversial, with staunch critics and ardent defenders of brunch. 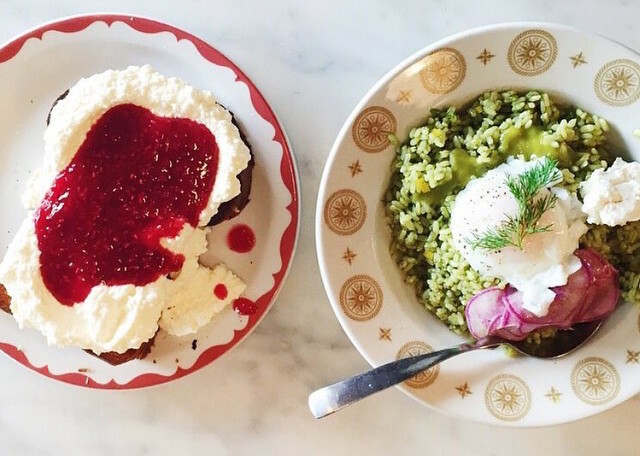 Dearest readers of LAist, have you begun your own forays into the world of breakfast? Has it opened your eyes to the wonders of eating food in the morning? Let us know in the comments. 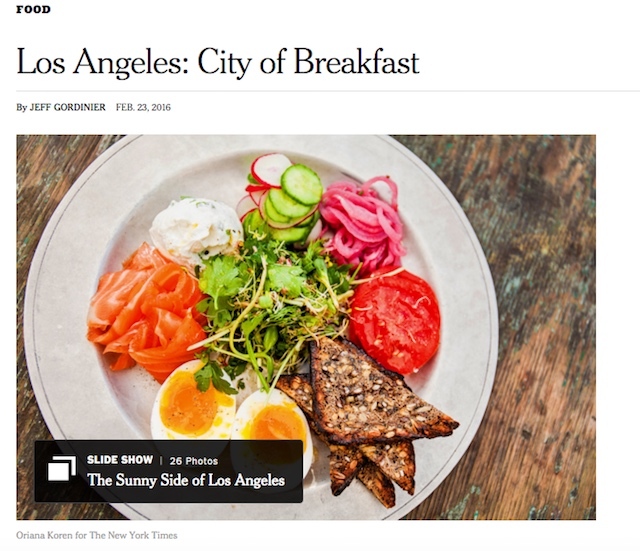 Related: The New York Times Thinks Los Angeles Is Cool Again!